72nd edition of Red Book (2018, dated 2019) soft cover edition. A Guide Book of United States Coins (Red Book), by R. S. Yeoman, is a pricing guide for United States coin collectors and is considered one of the most authoritative coin price sources. Editor R. S. Yeoman was the editor until he retired in 1970. In 1971 his assistant, Kenneth Bressett, took over as the editor of the Blue Book and Red Book until he retired in 2017. In 2018 Jeff Garrett, former ANA president, took over and assumed the post as senior editor, and still holds that position. Yeoman is still listed as the author of each edition of the books, and Bressett is listed as editor emeritus. The book is the longest running coin price guide. The first edition, dated 1947, went on sale November 1946. After the first three editions (dated 1947, 1948, 1949), the Guide Book was not published in 1949; annual publication resumed in 1950 with the 4th edition (dated 1951–1952) and has continued to this day. The book's all-time peak print run for a single year was 1.2 million copies in 1965. The 70th edition, cover-dated 2017, was published in 2016. 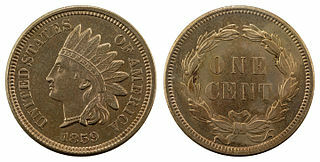 The Red Book lists the retail value of all United States coins from Colonial and pre-federal State Issues to all circulating issues, as well as commemorative and modern-day bullion coins, as well as other significant U.S. patterns, private and territorial gold, Hard-times tokens, Confederate issues, Hawaiian tokens and coins, Philippine issues and Alaskan tokens. It also shows Issue Prices and Current Values of mint sets and proof sets. The values are divided by main coin grades. The Guide Book got its Red Book nickname due to the book's solid red cover. Softcover (perfect bound) – 1993–1996, 1998, 2003–2006. Spiralbound softcover – 1997, 1999 to date. Spiralbound hardcover – 2008 to date. Large-print edition – 8x10, spiralbound softcover – 2010. MEGA red - only 4 editions were printed, latest in 2018, dated 2019. Early editions of the Red Book are collectible. The first edition has commanded $1,500 or more on the open market. The Red Book has its own Red Book – A Guide Book Of The Official Red Book Of United States Coins by Frank J. Colletti published 2009 by Whitman Publishing (ISBN 978-0-7948-2580-5). A facsimile of the 1947 edition was published in 2006, on the 60th anniversary of the publication of the first edition. Dubbed the "1947 Tribute Edition" (ISBN 0-7948-2230-4), it differs from the original by having a dust jacket (the first Red Book ever to have one) and an additional 32-page color section, comparing the coin collecting hobby in 1946 and 2006. Except for the dust jacket and color section, it was an exact replica of the first printing (with the phrase "scarcity of this date" on page 135). ^ "Kenneth Bressett Named First Editor Emeritus of the Red Book". Whitman.com. Whitman Coin and Collectibles Expo. Retrieved January 13, 2019. ^ "Jeff Garrett Named Senior Editor of Red Book". Rarecoingallery.com. Retrieved November 12, 2018. ^ a b c Tebben, Gerald (May 23, 2016). "Looking at the 'Red Book' at age 70". Coin World (2928). pp. 30–32. ISSN 0010-0447. A hardcover or hardback book is one bound with rigid protective covers. It has a flexible, sewn spine which allows the book to lie flat on a surface when opened. Following the ISBN sequence numbers, books of this type may be identified by the abbreviation Hbk. The dust jacket of a book is the detachable outer cover, usually made of paper and printed with text and illustrations. This outer cover has folded flaps that hold it to the front and back book covers. Often the back panel or flaps are printed with biographical information about the author, a summary of the book from the publisher or critical praise from celebrities or authorities in the book's subject area. In addition to its promotional role, the dust jacket protects the book covers from damage. However, since it is itself relatively fragile, and since dust jackets have practical, aesthetic and sometimes financial value, the jacket may in turn be wrapped in another jacket, usually transparent, especially if the book is a library volume. "A Window for Death", first published in The American Magazine as "Nero Wolfe and the Vanishing Clue"
"Man Alive" is a Nero Wolfe mystery novella by Rex Stout, first published in the December 1947 issue of The American Magazine. It first appeared in book form in the short-story collection Three Doors to Death, published by the Viking Press in 1950. "Kill Now—Pay Later" is a Nero Wolfe mystery novella by Rex Stout, first serialized in three issues of The Saturday Evening Post. It first appeared in book form in the short-story collection Trio for Blunt Instruments, published by the Viking Press in 1964.